Cervélo P5X Lamborghini Edition Bike on display at Bicycle World Friday, April 27, 2018 in McAllen. 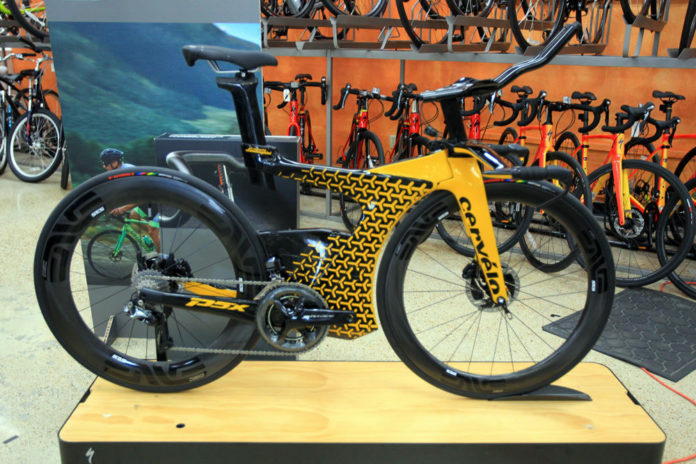 Italian luxury carmaker Lamborghini and Canadian Cervélo Cycles only made 25 P5X Lamborghini Edition models, high-end triathlon bikes. Only eight are in the United States, and one sits on a service rack at McAllen’s Bicycle World. Tracy Roberts, son of the shop’s owner, stands next to the yellow bike he’s tweaking for its local owner. Using his Body Geometry Fit training, riders go through a 25-step body analysis before even getting on the bike, Roberts said. The bike, which Roberts calls “world’s most aerodynamic triathlon-specific bicycle,” allow for maximum customizability, he said. Roberto Fantini reached out to the store about getting ahold of the bike he said he saw on Instagram. Roberts arranged the purchase, and said the establishment prides itself on snagging rare rides. Fantini started running half and full marathons with the goal of one day completing an Ironman Triathlon, a long-distance feet requiring participants to swim 2.4 miles, cycle 112 miles and then run a marathon. After completing an Ironman, Fantini debriefed with other athletes. His legs were hurting when it came time to run the last 26.2-mile leg, and he wanted to improve. Colleagues recommended a better bike. The P5X Lamborghini Edition has a completely innovative frame design, Roberts said. The yellow body, emblazoned with Lamborghini iconography, is elongated. So much of the bike’s construction is about reducing wind resistance. Aerobars, or handle bars that facilitate a rider to lean forward in a more aerodynamic posture, are currently being adjusted. “When you do triathlon, if you’re upright on the bike, your body becomes a wind shoot and it creates drag,” Roberts said, adding that the down position dramatically reduces resistance. One drawback is that the hydraulic brakes are not accessible on the aerobars, but on the more traditional handlebars. This makes the bike less safe on group rides, as the rider would need to move their hands to have access to their brakes, according to Roberts. Deeper forks and wheels allow for less drag, as well. Tires hug close to the frame, “limiting the amount of dirty air getting caught in that space,” he said. For Fantini, these small advantages can add up after more than 100 miles, but it’s not about the actual race. Preparing for a full triathlon is practically a part-time job, consuming 14 to 18 hours a week. Having a lighter, more efficient bike is a piece of equipment to assist in self-improvement.